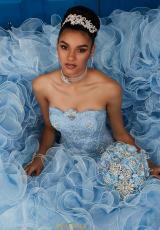 Feel like a princess in this stunning two piece Tiffany quinceanera ball gown 24034. Featuring a strapless sweetheart neckline and iridescent beadwork throughout the bodice. A corset lace back leads into a tulle and organza ruffled skirt. Find this showstopping dress and more Tiffany dresses at Peaches Boutique in Chicago.